Since the recent wet episode which resulted in a welcome 40+mm of rain between Mar 1st and 15th in East Anglia, dry weather has been holding its grasp across most of England and the forecasted rains seem to be pushed back pretty much on a daily basis. As a result, with a total of just 100mm, the cumulative precipitations for East Anglia between January and March 2019 remain at their lowest since 2012 following a very dry winter 2019 as depicted on the maps below from the MetOffice. 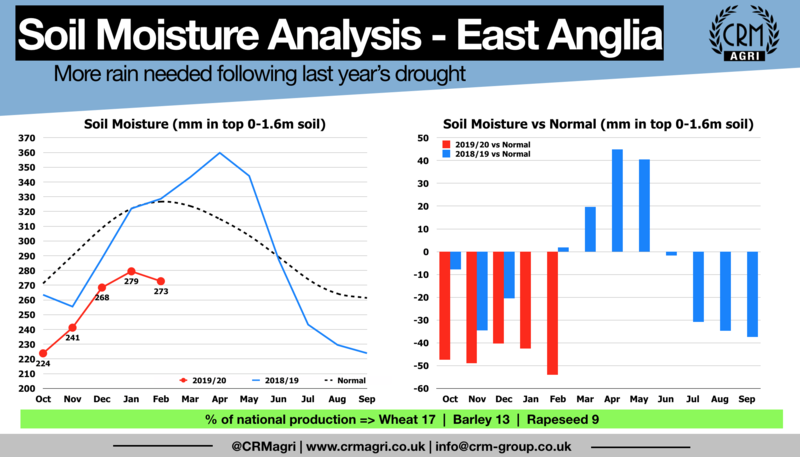 Following last year’s drought and below normal precipitation so far in 2019, soil moisture levels are still well below normal across most of the key grain producing regions of England. Therefore, it will be important to keep a very close on the forecast with crops soon entering critical stages for yield deterioration and being more vulnerable to drought than last year. That said, the CRM Agri forecast for the 2019 UK wheat harvest still stands at a 5-year high of 15.1MMT.